The mission of the Emmetsburg Community School District is to prepare responsible and productive citizens for an ever-changing world by the utilization of our total resources through a partnership of the family, school, and community. All students will be proficient in reading comprehension to be prepared for success after high school. All students will be proficient in Math to be prepared for success after high school. All students will be proficient in Science to be prepared for success after high school. All K-12 students will use technology in developing proficiency in reading, math, and science. All students will feel safe at and connected to school. The majority of the high school students graduate with some college credits. We work closely with the Career Academy at Iowa Lakes Community College to accomplish this. 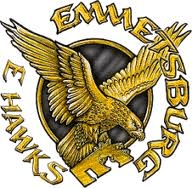 Emmetsburg is a member of the “Lakes Conference”. Some of its activities include: Football, Show Choir, Wrestling, Cheerleading, E’Hawk Buddies, Volleyball, Vocal, Community Service Program, Cross Country, Publications, Concert & Jazz Band, Student Council, Advanced Business Technology, Large, Small & Individual Speech, Art, Quiz Bowl, Basketball, Drama, Track, etc. The mission of Emmetsburg Catholic School, in partnership with parents, is to prepare its students morally, intellectually, and globally to be responsible Christians through integration of religious truths and values with all learning and living. The Emmetsburg Catholic School is a family-oriented school, serving families from Emmetsburg, Mallard, Cylinder, Graettinger, Estherville and Ruthven. Students from all faiths are welcome. Tuition assistance is available to all families. The school shares athletics with Emmetsburg Public School. Students have the opportunity to be involved in football, track, cross country, wrestling, and basketball. Catholic School serves Preschool age to 8th grade students. It is located at 1903 South Broadway Street in Emmetsburg. Iowa Lakes is a two-year Community College founded in 1967. It is designed to provide affordable education to the residents of northwest Iowa and southwest Minnesota, and it is dedicated to serving the changing needs of its students and the communities it serves. Iowa Lakes is comprised of five campuses: Emmetsburg, Estherville, Algona, Spencer, and Spirit Lake. Currently, over 3,900 students are enrolled on all campuses of the College. Iowa Lakes offers a variety of classes and programs, such as liberal arts, career option, and vocational-technical programs. Continuing Education programs help to provide workplace training for area businesses and industry. In addition, Iowa Lakes supplies relicensure courses, Adult Basic Education, high school completion by taking the high school equivalency test (HiSET), the Small Business Development Center, the Retired and Senior Volunteer Program (RSVP) and short term vocational training. Students may choose to take classes during the day or evenings or weekends from any of the five campuses. Iowa Lakes Community College awards a variety of degrees, diplomas and certificates. To be eligible for a degree or diploma in a credit program, you must successfully complete the last 15 credits before graduation in courses you take at Iowa Lakes. The Emmetsburg, Estherville, and Spencer campuses provide on-campus housing. The dorms provide the opportunity to develop lifelong relationships, share activities and interests with others, and to experience independence and responsibility. Students participate in a variety of activities, including intercollegiate sports, music groups, Student Senate, newspaper, radio, and many clubs and organizations. Students choose Iowa Lakes because of its accessibility and low cost, and the availability of scholarships, grants, and other financial aid. Iowa Lakes prides itself in providing state-of-the-art technology in its classrooms, labs, student centers, and dormitories. It believes in quality education and training on the tools students will be using on the job. The faculty and staff are knowledgeable and committed to the success of each student. Iowa Lakes offers outstanding faculty, services, career programs and fields of study at the right price, place and time for each person. You are invited to visit the facilities on any campus. You’ll have the opportunity to tour the buildings, sit in on a class, and meet personally with a professor to discuss your future goals.